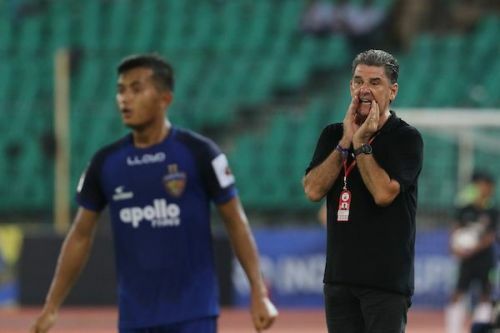 A disappointed champions' team is making its way to the 'Den' as Chennaiyin FC face off against Delhi Dynamos at the Jawaharlal Nehru Stadium in Delhi this Tuesday. This match, which is of equal importance to both the teams, will showcase a battle of tactics between two 'yet to settle' managers of the season. Delhi Dynamos, preparing for their 4th game of the season haven't won a single match yet. While they drew the score with Kerala Blasters at Kochi, Dynamos lost to ATK and collected a single point with a draw against Pune City at home. They have 2 points from the 3 matches and have failed to keep a single clean sheet. There will be plenty to worry about for Josep Gombau when they host Chennaiyin FC. Things have not been going right for Chennaiyin either. They have lost all the three matches severely and are at the bottom of the points table. Conceding 8 goals in 3 games isn't a good number for the English manager. Defeats against Bengaluru FC and FC Goa were followed by the big loss to NorthEast United, going behind after leading with 3 goals. A complete revamp will be expected from John Gregory too when taking the field at Delhi. Dynamos had their valuable midfielder Marcos Tebar injured and he had missed the matches against ATK and Blasters. The Spanish-man remains doubtful for this fixture too. Adria Carmona, who was introduced in the second half on two occasions, might be given a start against Chennaiyin. John Gregory does not have many problems with individual contributions of his players, but it is inconsistency and lack of combination that is a nightmare. Custodian Karanjit Singh has already let a number of balls in, but does not have many replacement options. Gregory Nelson might come back to the first XI and Jeje might be relied on again. However, a full squad is available for the manager with no injuries or suspensions. Delhi Dynamos will seek the speed and skill of Lallianzuala Chhangte on its wings to trouble the Chennaiyin FC right back - most probable Inigo Calderon. Calderon might have a tough time catching up with the young legs of Chhangte but it has to be seen whether youth bypasses experience. Things will be simple for Chennaiyin FC to win the match. For this nothing less than goals will be expected from the out-of-form Jeje Lalpekhlua. Though it is difficult to vest the responsibility of winning the match on the shoulders of a player who is far from his best, the manager should do it. Thus, Jeje will be key in Chennaiyin's performance at Delhi. Although Delhi seem to be in a better position than their opponents, the winning goal might come from the visitors. The Machans, who are capable of turning things upside down, might start their journey at the Dynamos fort.